I'm here right now in South Dakota going after a different feathered quarry--pheasants, ducks and geese. Polaris, Winchester (guns and ammo), Browning and Mossy Oak teamed up to host a group of writers from the hunting and ATV world to test their products in actual hunting situations at the Prairie Sky Guest and Game Ranch. Amid howling wind and snow flurries (Is it really necessary for winter-like weather yet? ), we got warmed up for the event today by shooting clays on a grassy, windswept hillside and terrorizing the terrain in one of Praire Sky's pastures with Polaris' Sportsman 500s and Ranger XPs. The ATVs and Rangers were both the upscale packaged Browning additions and were quite impressive. They wouldn't let us jump any hills or submerge them in the deep prairie potholes, but I have a hunch had they let us, the equipment would have faired much better than the rider. The shooting highlight came when Howard Communications' Kevin Howard and writer Nick Sisley got the bright idea for us to take turns shooting at a crossing, high-flying pigeon and move back 10 yards between each shot until nobody could hit the target anymore. What a great test, not so much of shooting ability--much of the shots were pure luck and nothing you would want to try on live game--but more of the ultimate capabilty of the Winchester loads. We were launching them through a mix of field-grade and sporting over/unders as well as Browning and Winchester's lines of semi-autos. Ben Maki with Mossy Oak, miraculously punched a clay from the sky at 75 yards (my best was 65), which drove the more classicly trained shooters of the group bats. Suddenly everyone had to try and try again and eventually Sisley and Mossy Oak's Brady Arview achieved the feat. For the record, Maki was not able to replicate his success. As I write this, Maki is whining over my shoulder that at least he broke one on his first try while Arview required EIGHT shots. I'll be back tomorrow with an update and pics of how the actual hunting plays out. Stay tuned. For turkey hunter's looking for an awesome hunting experience, Maine is a destination you won't want to pass up, particularly now that the state is open to nonresidents without having to enter a draw. That's right, for the first season ever, hunters can visit the state and simply buy a turkey tag and license right over the counter. And with hundreds of thousands of public land available, a good deal of it populated with seldom hunted turkeys, it may well be one of the best hunts for Easterns you could hope for. I had my chance to check it out firsthand this season, but a schedule conflict will prevent me from making the trip, but you can bet I'm planning a trip for next year. In the meantime, for a snap shot of what hunters can look forward to for this late season, which runs until June 3, click here to read what Ken Bailey with Village Soup has to say. Ray Eye is one of last, true old-school "characters" in our hunting world. A mutual friend recently sent me a link that had me laughing so hard I fell out of my chair. On Ray's Web site, he has the usual hunt pics, tips and promos for upcoming shows, etc. But there in the middle of it all, was also a link to restaurants in which Ray likes to eat! As I climbed back into my seat, I had to wonder what type of scheme ol' Ray (pictured here at the Coffee Pot. Note the spooky photographer shadow in the upper left hand corner of the picture. Kind of has a Blair Witch quality to it.) 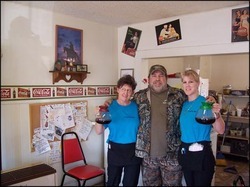 was working on with these places--discounted meals, free refills, a new location from which to do his radio show. This time of year frequently finds him doing them from a turkey blind! No joking. Anyway, if you're hunting Missouri this season and looking for a place to stuff your face, try one of these colorfully named joints (click here for list). In fact, tell them Ray sent you! It seems the season has barely started (and in most places hasn't) and already in just a matter of weeks it will come to an end in Florida. As of last week, however, those hunters with a last chance urge to try their hand at an Osceola or better yet, a single season Grand Slam, are still in luck. I hear the folks at Cabela's Outdoor Adventures still have a few Osceola hunts available for THIS season. If you're interested, call Jason Berger at 800-346-8747. It's a good bet that if you need another subspecies to fill out your Slam plans, they can probably help you there as well. For these and other hunt opportunities, check out Cabela's Outdoor Adventures Web site.